1962-1965 CORVETTE EXHAUST MANIFOLD BOLT & STUD KIT. INCLUDES 8 SHORT AND 3 LONG BOLTS. WITH 1 SPECIAL MANIFOLD STUD TO REPLACE LONG BOLT. 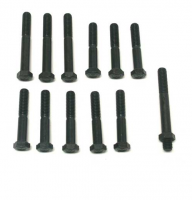 Log In To See Pricing 1956-1979 CORVETTE EXHAUST MANIFOLD BOLT KIT. 12 PIECES. FOR ALL SMALL BLOCKS. Log In To See Pricing 1953-1982 CORVETTE EXHAUST MANIFOLD BOLT. SOLD AS EACH. DOUBLE CIRCLE HEADMARK, 3/8-16 X 1 1/4, NATURAL WITH HEAT TREAT.